Darryl Moland, a 21st-century Renaissance man, came up with a stunning coffee-table book that celebrates decorative art year-round. This work beautifully migrates from social media to three-dimensional magic. If you want to create your own art book, follow this lesson from a Time Inc. (Southern Living and Cooking Light) print veteran. 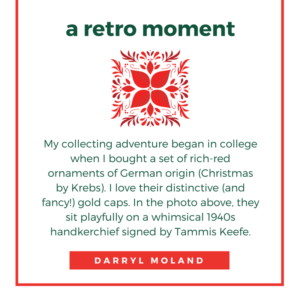 The book’s title and content derive from Darryl’s well-loved blog: The Decorated Tree: A Modern Ritual Celebrating the Seasons. Winter Wish plays it cool against the hot, lush tones of Fire & Ice. “There’s more than one reason to celebrate the season,” Darryl says. 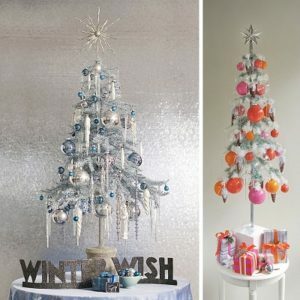 “The decorated tree is a natural way to make it festive and fun. 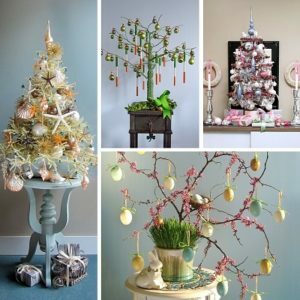 Rely on combining decorations that speak your language and you’ll find a pleasing holiday aesthetic along the way.” Then he fulfills this promise with 30+ designs that take you through spring, summer, fall, and winter in an array of themes and moods. In other words, there is something for everyone, whatever his or her aesthetic taste. The Decorated Tree is a loving tribute to Darryl’s mom, who nurtured his talents, always encouraging his natural creativity to decorate the family tree. “I eventually took over the task each year until I went away to college and embarked on my life away from home,” Darryl remembers. 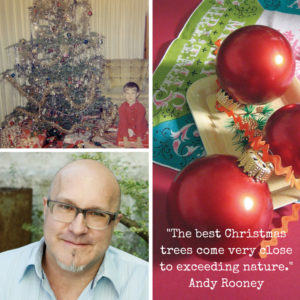 “It wasn’t a chore at all for me—I would lose myself in all the lights and glitter.” Within a few years, he became the community expert on tree decorating. Neighbors and relatives waited breathlessly for his creations at Christmas, and soon he was trimming a second, even third, tree for the house. Darryl deftly changes the mood so you’re never bored: Endless Summer, St. Patrick’s Day Tree (Faith, Hope, Love & Luck), Tree of Dreams, and Good Eggs. The author’s creations (embellished by objects from his personal collections) and moving words (often drawn from memory) make quite the holiday package. Here’s another idea—it’s the perfect wedding gift for a bride waiting to connect with her inner muse so she, too, can devise a lifetime of new rituals for her own family. A parting notion: if you want to send the coolest Christmas card ever by email to your artsy friends, the book is available in PDF format. The heart of a literary soul truly beats within this visual artist.